Satisfied customers is our measurement for success. The Mansour family would like to say that the service, work, and professionalism on of the DBC Company staff was superb during the repair work done at our home in 2008. We also would gladly refer DBC to other potential customers. In October 2006, I had a kitchen fire that caused my insurance company State Farm to recommend DBC Company, Inc. to be the contractors on my job. They put in a new kitchen in our home that is magnificent. The work they had to do to the rest of my home, I was completely satisfied with. Dave who is the owner of DBC was so wonderful to work with. Mary, who I spoke to on the phone a number of times, came out to give me some very good advice on things in our home (Just another women’s touch). DBC was very helpful and understanding through this entire process. The company is very knowledgably and very conscience in everything they do. Dave was right their to supervise and made sure that the job was done to his perfection and approval. That meant a lot to my husband and me. My husband and I would highly recommend DBC for any contracting job. The quality of their work is so superior. The people that Dave has working for him, where very nice, also knowledgeable. Knowing Dave as we got to know him, he would only have the best working for him. When I called Mary that I wasn’t satisfied with something, she was right on the phone with Dave. He came right over to our home and he had it taken care of immediately. If and when my husband and I ever need any other work done on our home,we would not hesitate to call DBC. We are more than satisfied with the job. When friends and family come into our home, the first thing they would say would be, your kitchen is simply beautiful. People always ask you “Who did the work”. My husband or I would always tell them. We had the best Company, DBC and they where just great. Thanks again for all your patience and hard work you put into our home. We love it. On behalf of Carriage House Cooperative, it’s Board of Directors and myself I would like to express our thanks for a job well done. We were fortunate enough to have your company referred to us by State Farm. Your staff was courteous and communicated with us regarding the progress and our satisfaction. The repairs to our maintenance garage were completed professionally and in a timely manner. It is as good as new! I would not hesitate to refer your company. Thank you again. I just wanted to thank you again for all of your help. You and your staff’s kindness has been so greatly appreciated. Your company turned around a horrific situation we had with the flood to our home, the obstacles with had with State Farm and the horrific first preferred provider they first sent out. The situation at first was so horrific when the first State Farm sent out their first preferred provider, Derris Marshall from Propertech. They took no care in handling our belongings their worker, Rick, yelled at me when I suggested that they move my lamps and other belongings out after they had already started demolition on the basement. It took them so long to even get the job started. It was very difficult waiting so long and having our home in shambles with a disabled, elderly father. They started the job approximately a month later than first scheduled and normally showed up late and would only work a few hours each day. When I mentioned this to Rick, he said that our job wasn’t the only one that they were doing and could not give me a set time they would be working. I mentioned to Derris Marshall that we had found further damage to two of the cabinets in our kitchen and had to call him several times to try to get him to come to look at it. 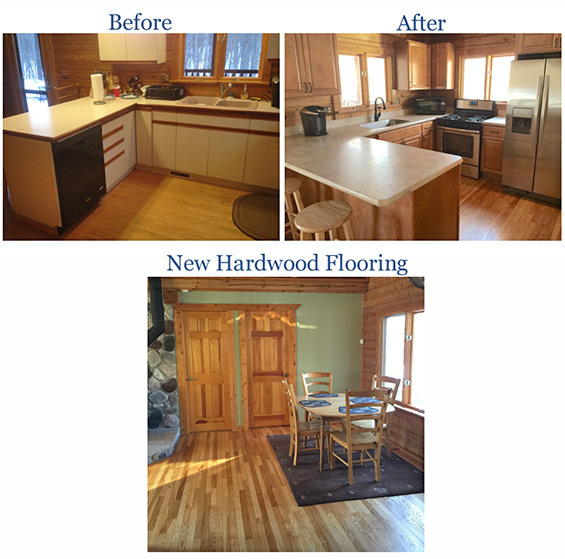 When he finally did, he said that he would have to add additional work to the claim and would not be able to match the cabinets so they all would need to be replaced and our kitchen would need to be demoed. After a few days of construction, we noticed that the walls all looked bowed everywhere. My neighbor looked at it and showed me on the label on the (MDF) material they were putting up which stated not to apply directly to the studs. When I complained to Derris Marshall, he didn’t even bother to show up for our scheduled appointment to look at the work and did not even bother to call me throughout the entire weekend. He did send his workers out to continue work that Monday. Our city building inspector put a stop work order on the door. Derris Marshall from Propertech said he did not want to complete the job because “I was upset”. That feeling was mutual and I was leery of letting State Farm send out another “Preferred Provider”. Jerad with State Farm came out with Steve from DBC to look at the work and they both agreed that the wrong materials had been used. Steve also looked at our kitchen cabinets and offered a solution of repairing the sides of the cabinets rather than demoing the entire kitchen. You guys did a great job…and our kitchen didn’t have to be gutted……THE CABINETS MATCHED PERFECTLY!!!! . Just as DBC was to get started, State Farm added another glitch because they wanted to re-analyze the material because the repairs would be more costly. This was causing great hardship having the house in such a shambles and trying to tend to my Dad’s needs. Although this held up construction for a short time, it would have been longer if Steve hadn’t offered a “solution” of adding drywall and reusing the MDF as wainscoting with trim. He had DBC do the additional labor “at their expense”. DBC company and its staff worked with Top-of-the-Line PROFESSIONALISM! The crew performed the work, ON-TIME, worked OVER TIME AND ON SCHEDULE to accommodate us. While the construction process was going on the jobsite was always kept clean and we were always kept up-to-date with the process and progress of the job. Everyone was kind and compassionate to our needs. We felt sad when the job was done; it was like your crew had become part of our family. They did such a wonderful job on the basement that we get RAVING COMPLIMENTS from all of our guests! Shortly after the job was complete, Steve and DBC came to our rescue again! We decided to have the basement windows replaced. We called a company Metro Glass Block that started tearing the windows out “from the inside” and ruining the ceiling in the basement. After I complained they drove off with and left my windows broken out. Steve sent one of his staff out to board the windows up free of charge. Before I could get out of bed the next morning, there was a company, Glass Block Concepts – that Steve had sent to give me an estimate knocking on my door. They did a terrific job! Apparently the windows were double framed and the first company was too lazy to remove the heavy metal frames from the outside. Steve, I can’t thank you and your workers enough for the terrific job you did and all of the compassion you have shown. I would highly recommend DBC Company Inc. to anyone! Thanks to all of you (Steve, Ray, Sid, Joe, Adam, and Tim) for doing such an excellent job! Hi Mary, I am writing to you guys at DBC to let you know that i am very pleased with the job that was done at my house on 1795 marlette rd. I am a state Farm customer and was told about DBC being pre approved with them, so i called and set up an estimate with Dave, everyone that came to my house from your company treated me great, the guys did great work and made sure i was happy. i didn’t have any trouble contacting all of you for customer service after the job either, just wanted to thank all of at DBC that worked on my home. On January 19, 2009 my home sustained damage as a result of the collision of a car into the back wall of my residence. State Farm immediately “set the wheels in motion” to begin the repair process.through D.B.C. Company. On Jan. 20 Dave Malkiewicz assessed the damage and explained to me the steps and timeframe involved to repair the damage. All of my questions were answered thoroughly and precisely. Another D.B.C rep arrived later the same day to affix a temporary “patch” over the hole in the wall as a result of the impact to prevent possible freezing and/or water damage entering the inside wall. American Home Renovations then completed the repairs. My experience with D.B.C. Company is one of great satisfaction at the timely, efficient, and professional process implemented to restore my residence to better than new condition. I would recommend D.B.C. Company to anyone considering restoration or other services. My compliments to everyone at D.B.C. for a job well done!! The work was completed in less time than estimated and was most efficient. Our worker was neat and genuinely “cared” about our home during the job. He was polite and respectful. I am very pleased with the repair and would recommend DBC. Thank you to State Farm for selecting this company as one of your Premier contacts.